A true New York bagel is a beautiful thing: boiled and then baked, dense but not too dense, with a glossy, crackly outer crust and squishy insides that, when fresh, should never require toasting. But not every bagel in New York is a true New York bagel, and nearly every New Yorker has a strong opinion on which spot is the best. 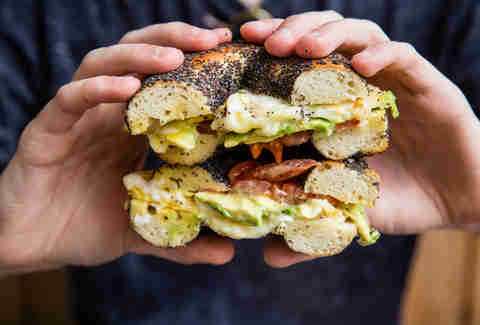 To help you avoid all the puffy, bready, crumbly, and otherwise inferior specimens out there, we’ve rounded up the best bagel shops across the city. It’s moved around a bit in the last few of years, but this family-owned favorite has remained mostly the same since it opened in the '70s. The only change? They’ll now toast your bagels -- previously verboten -- though the fresh, hand-rolled beauties still don’t require it. They’re huge, with the squishy interior and crisp crust that define a great, classic bagel. There's also a vast array of spreads, smoked fish, and egg sandwich options, and often a line out the door. Peer past the counter at this quaint Columbia University-area bakery and you’ll see the enormous steaming pot and wide-mouthed oven that supply Absolute with a steady supply of fresh, pillowy bagels. The spot often draws a long line, but it’s worth the wait for one of those soft-on-the-inside, lacquered-on-the-outside rounds. Just remember to bring cash -- cards are not accepted. True to its name, this Park Slope spot is a hole in the wall: dim, well-worn, and standing room-only. But it turns out shining examples of the old-school bagel style: Dense, chewy, and a more reasonable size than some of their lesser, fluffier counterparts. There’s no toaster on premises, and there’s really no need for one, since it’s almost always possible to get a warm, fresh bagel. This 82-year-old LES institution got a new set of owners in 2013, followed by a fresh new look. It’s best known for its bialys, but the chewy, brick oven-baked bagels are just as good. The current operators bulked up the menu with a number of new spreads and sandwiches, like The Czar with nova, pickled beets, salmon roe, and parsley dill cream cheese on a pumpernickel bagel, plus pizza bagels for $3.25. 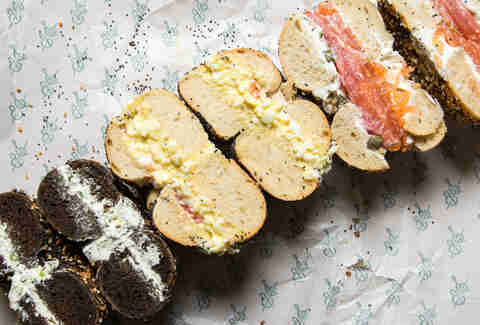 The bagels at this buzzy, mini-empire are unique on this list as they’re not strictly New York-style. 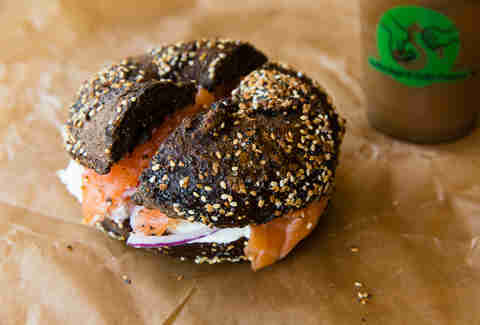 Restaurateurs Matt Kliegman (of the Smile) and Noah Bernamoff (of Mile End Deli) have created a cross between a New York bagel and a Montreal bagel that’s chewy and dense, but also boiled in honey water and baked in a wood-fired oven like they do up North. The result is a little bit different but still delicious, especially when paired with Black Seed’s fancy toppings like beet-cured lox with horseradish cream cheese, radishes, and herbs. 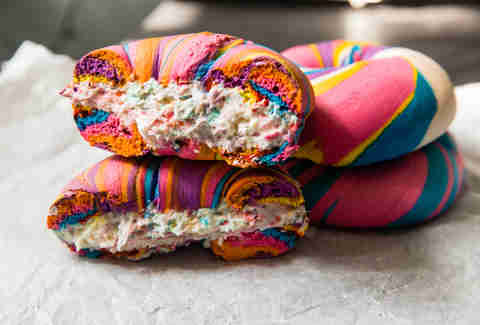 Remember the great rainbow bagel mania of 2016, when New York went nuts for prismatic bagels filled with Funfetti cream cheese? That was the work of the Bagel Store. 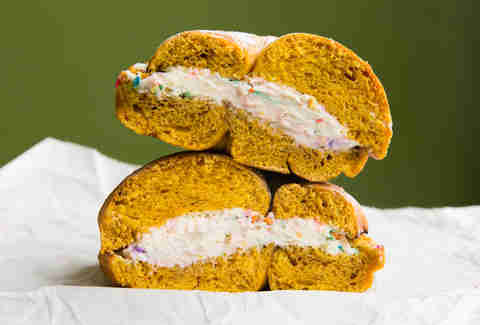 But its creativity didn’t begin or end there: The Williamsburg shop also makes pretzel bagels and cragels (that’s a croissant-bagel hybrid), plus a host of over-the-top cream cheese flavors like cannoli and bacon-Cheddar. 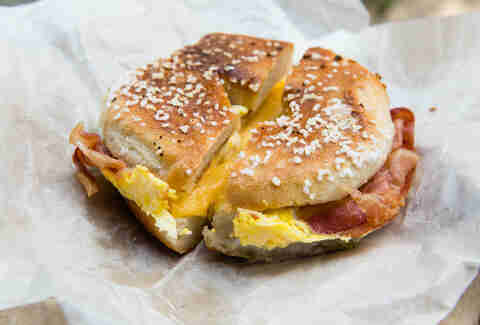 If you’re a traditionalist, it’s also been making excellent, no-frills breakfast sandwiches since long before anyone thought to add food coloring to their bagel dough. 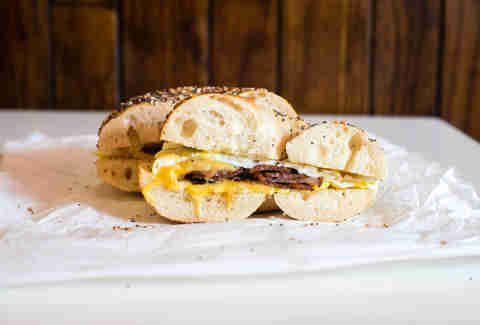 This hugely popular neighborhood spot, now with two shops in the East Village, is known for its chewy, hand-rolled bagels, and excellent bacon, egg, and cheese. You’ll also find some “specialty” bagel flavors like French toast here, but where the shop really goes all out is with flavored cream cheeses. The 25 different flavors include dessert-y options like chocolate chip cookie dough, fruity picks like pear, and savory schmears like bacon herb, wasabi, and cucumber dill. Waits can be long, but all the more time to decide on your signature flavor combo. 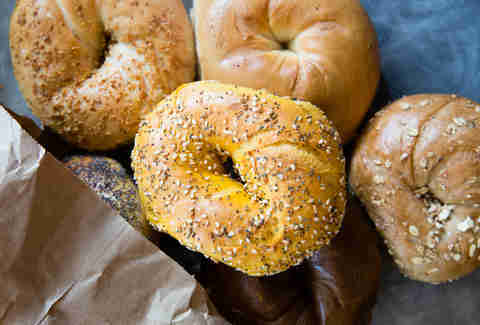 For over 50 years, this Fresh Meadows bagelry has supplied Queens with soft, traditional, kettle-boiled bagels 24 hours a day, seven days a week. Bagels come in all the classic flavors, and are always generously stuffed, whether you opt for whitefish salad, lox, or one of many flavored cream cheese options (including bacon). Major Food Group (of Parm and Carbone fame) is the brains behind this upscale take on a Jewish appetizing store. The bagels, which you can order to-go from a counter (or pair with a lox platter at a table), are a bit pricier than most at $2, but well worth it. Baker Melissa Weller makes them the old-fashioned way -- dense and chewy with a crackly crust -- but tweaks the classic flavors in clever ways. 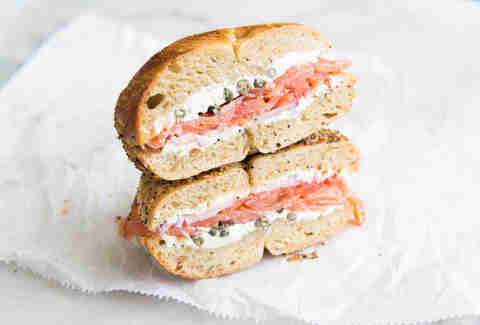 Her “Everything 2.0” bagel adds fennel seeds to the traditional everything blend, while her version of a salt bagel involves delicate Icelandic sea salt and a black pepper-laced dough. Whatever you choose, be sure to add house-cured salmon and cream cheese. David’s is completely no-frills: The furniture is dingy, the menu board is ancient, and the bagel roster sticks strictly to the classics. A whole wheat everything bagel is about as close as this place gets to any newfangled flavors, and that’s just the way it should be. You’re here for the lofty, tender bagels, generous schmears of cream cheese, and a really good egg sandwich. There’s a decent amount of seating inside Terrace Bagels, which from the outside looks like your average neighborhood deli. But on weekends the place fills up fast with locals lining up for the huge, hand-rolled bagels that combine a perfectly chewy, crackly crust with a fluffy, moist interior. 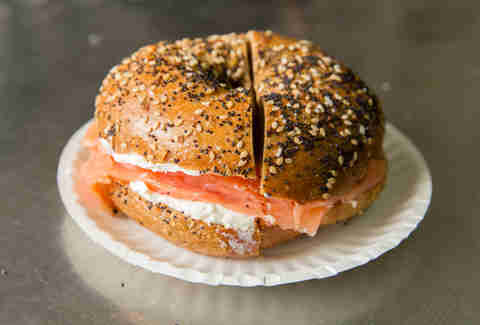 Luckily, Prospect Park is just a block north, so you can take your bagel and lox to-go and eat breakfast al fresco. For many years, this century-old appetizing store sourced its bagels from the Bagel Hole in Park Slope. 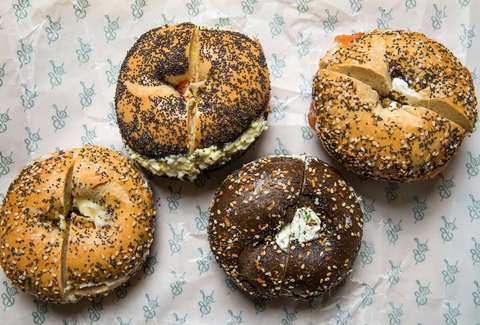 But after the 2014 opening of Russ & Daughters Café, a full service restaurant a few blocks over, the team began making their own bagels for both shop and restaurant, with great results. These crusty rounds are compact and chewy -- the ideal vehicle for a pile of Russ & Daughter’s silky hand-sliced lox and cream cheese. Strangely enough, there are zero outposts of this mini-chain in Brooklyn. 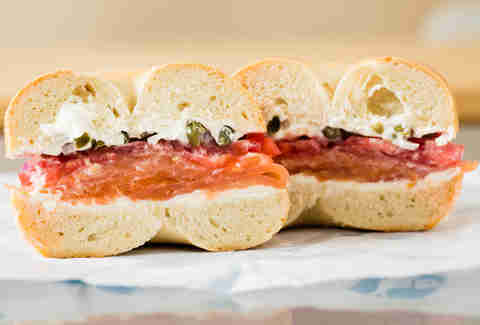 But you’ll find hand-rolled rounds with a nice crispy-chewy crust at the three locations Astoria and two in Manhattan. BB&CC goes all-out with the cream cheese flavors, drawing on deep wells of creativity to come up with the cream cheese flavor of the week, which might include Key lime or cool ranch. Conveniently located just outside of Penn Station, this old-school deli actually lives up to its name with big, squishy, freshly baked bagels, which can be topped with the sandwich fixings of your choice. Whether you go for a bacon, egg & cheese, cream cheese & lox, cold cuts, or some combination of all those things, it’s guaranteed to be piled so high that you’ll barely be able to fit the sandwich in your mouth. Marguerite Preston is a freelance writer based in Brooklyn. She is strictly an everything bagel with scallion cream cheese kind of person.